The Villa Noosa Hotel has become a complete entertainment destination, popular with both locals and tourists alike. We offer a friendly atmosphere where all your dining and bars entertainment needs can be found. Our Bistro offers an extensive menu and includes our Graziers Steakhouse chargrill, all your favourite pub fare, seasonal dishes, plus a fun kids menu to keep the children happy. The Sports bar features all your sports action along with Sky Vision and TAB facilities. Live music also features in our Sports bar and locals and travellers alike find relaxation in the bars and lounge area very easy to do. Accommodation guests enjoy our comfortable accommodation facilities and the convenience of our Hotel facilities. Our location near Noosa Heads makes us a popular destination for tourists and travellers. Our Hotel has something to keep everyone happy. Feel free to have a look around the site to see what everyone in Noosa is talking about. Open for lunch and dinner every day, the Graziers Steakhouse is a key dining spot amongst locals in the know.Whether you're a local, or just visiting, make sure you take some time out to visit us for a delicious meal. In keeping with our motto of something for everyone, the Sports Bar has all bases covered. With over nine screens solely dedicated to Read Rating and four large plasma televisions showing Sky Vision the TAB is one of the busiest spots in Noosa for the keen punter. The Sports bar is also home to the most plasma screens on the Sunshine coast dedicated to sports. No matter what your code the Villa has it on. By night the Villa takes on a different atmosphere. The TAB and sport screens are replaced by the latest music and events. 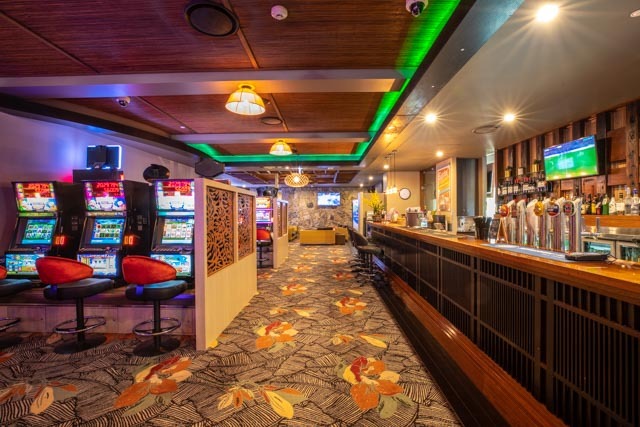 Villa Noosa Gaming room features 45 of the latest gaming machines, Keno terminal, and link jackpots including the latest Lightning Link Machines. We have Ticket in Ticket Out system operation on our machines allowing you to move quickly and easily between machines.